Korcula has a lot to offer to a visitor to see and learn - its art and history, its culture, traditional crafts and skills of stone masonry and shipbuilding, sword dances, music, writings as well as its most famous inhabitant – Marco Polo and his heritage, besides all the natural beauties, views and beaches. Korcula's nearest airport is Dubrovnik Airport. Korcula is fairly easily accessible from the Croatian mainland by various ferries. 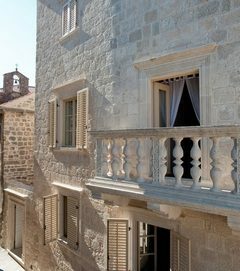 A newly opened 4* family hotel situated in a traffic free zone and immediate vicinity of a comfortable beach which provides a perfect setting for your ideal holidays in the thousand-year-old city of Korcula. 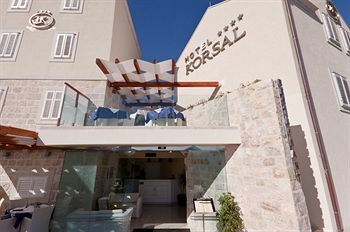 The rooms are fully furnished with natural materials and overlooking the sea. Hidden within the walls of the charming medieval town of Korèula, with its winding alleyways, terracotta-tiled houses and tiny churches, travellers will find Lešiæ Dimitri Palace, next door to the house of Marco Polo and only a stone’s throw from the crystal clear Adriatic Sea. The Hotel occupies an 18th century bishop’s palace and five medieval cottages, offering luxurious accommodation in six residences, complete with five-star services, a spa and a restaurant overlooking the breathtaking Dalmatian archipelago.